Posted under Health Guides. Updated 19 July 2017. Alopecia areata is a chronic skin condition that is marked by areas of hair loss, typically on the head, eye-brows and eye-lashes. Alopecia areata is not contagious. People with alopecia areata can live a healthy life. Alopecia areata pronounced (al-o-PEE-sha, air-ee-AH-tah) is thought to be an auto-immune skin condition that causes hair loss. It is a chronic condition where people can have “relapses” of hair loss (when the symptoms return then go away and come back again) at different points in their life. People who have alopecia areata have an immune system that for an unknown reason attacks certain hair follicles by mistake. The immune system is made up of organs, cells and tissues in the body that typically protect the body from harm such as an infection. In some cases the immune system doesn’t work correctly. Scientists are not exactly sure why this happens. Anyone, male or female from all races and ethnic backgrounds can be affected with alopecia areata. In fact about 1 out of every 50 people will have symptoms of alopecia areata at some point in their lifetime (usually before the age of 30); however, the condition usually begins during childhood. Someone who has a family member with alopecia areata has a higher risk of having it. What are the signs and/or symptoms of alopecia areata? People who have alopecia areata may first notice they are losing hair when they see clumps of hair on their pillow. As more hair falls out they will likely see smooth round patches of complete hair loss on their scalp but other areas of the body can be affected too. It is most common to have just one or a few patches of hair loss but sometimes a person may lose all of their hair (on their head) including eyelashes and eyebrows. This condition is called areata “totalis”. Some people may lose all of their body hair (areata universalis); however, this is less common. Alopecia areata can affect a person’s fingernails and toenails- nails look dull and thin and in some case they may have white spots and appear “dented”. The shape of the nail usually doesn’t change and they typically don’t fall out. People who have alopecia areata do not have pain related to the hair loss and can live a healthy life. About half of all people who have mild symptoms of alopecia areata will not have permanent damage to the hair follicle, so their hair will grow back naturally. However it can take up to a year. The other 50% may have permanent hair loss with or without scarring. A health care provider can usually diagnose alopecia areata by looking at the patches of hair loss as the area is usually smooth with short strands of hair that have broken off. Sometimes the provider may order a blood test to check for other possible medical conditions/autoimmune diseases that may cause hair loss such as anemia or thyroid conditions. Rarely, a biopsy where a small amount of tissue is removed from the area is needed to make the diagnosis. No. Alopecia areata is not contagious and cannot be passed on to others. Unfortunately, there is no cure for alopecia areata at this time; however, science is always moving forward and a cure may be possible in the future. The good news is there are medicines that are effective for some people. What kind of a doctor treats people with alopecia areata? A primary care provider can treat mild alopecia areata but more often a person is referred to a “dermatologist”, a doctor who specializes in caring for people with skin conditions. People who have mild alopecia areata may not need treatment as their hair may grow back naturally. However, others with moderate to severe hair loss will likely benefit from treatment. The goal of treatment is to encourage hair growth and stop further hair loss. Topical ointments which are applied to area(s) of hair loss are most often prescribed first. These include “corticosteroids”. This type of medicine stimulates the follicles so hair will grow. When topical therapy doesn’t work, injections (shots) may be suggested such as Triamcinolone which is given in the scalp or on the face (eyebrows) depending on where the patches of hair loss are. New hair growth usually takes about 4-6 weeks. Injections are repeated at every 4-6 weeks until the hair has grown back. The medicine is usually stopped after 6 months if no improvement is visible. Other medications such as minoxidil (ex. Rogaine), anthralin, topical immunotherapy and/or photochemotherapy may be suggested when alopecia areata is advanced. Is it normal to feel sad about having alopecia areata? It is totally normal to feel upset about having hair loss, but it is also normal to not be concerned; or even in time to feel proud. Everyone handles hair loss differently; however, many young women feel embarrassed about their hair loss and find it helpful to talk with a counselor or therapist. Some young women choose to wear a wig or hairpiece, hat or scarf, false eyelashes and have a temporary tattoo (if they have no eyebrow hair). Learning about alopecia areata is empowering and finding others like you through support groups can help you realize you are not alone. National Alopecia Areata Foundation (NAAF), www.naaf.org- a national support group in the United States that provides education and support to patients and their families. This organization supports research and also provides information on local support groups via their website. We are grateful to Devon Carrow for writing the following section about the most frequently asked questions and concerns that she has received from young women with alopecia areata. If my parent(s) has alopecia areata, will I get it? Not necessarily, but no one really knows for sure why the immune system acts the way it does when it comes to alopecia. It is common for alopecia to run in families in which there are other autoimmune diseases. However, not every person in the family will get an autoimmune disease. Your mom or dad could be the only person in your family who develops alopecia. Alopecia areata results from many different genes, not just one particular gene. There is no predictor for someone to know if they will inherit alopecia. According to scientific studies, many researchers believe the risk of developing alopecia from a parent is much lower than 1 in 5. Overall, the risk of someone having a child with alopecia areata is very low. Will I have to wear a wig or hair piece? It is completely up to you whether you would like to wear a wig, hairpiece, hat or scarf! If you are happy with how your hair looks, then rock it without a worry! It is good to keep in mind that alopecia effects people in different ways. Some people only lose little patches of hair, some people lose all of their hair, and most people are someplace in between. If you get to the point where you feel that you would like to wear a wig, then you can do some research to find one that is flattering and affordable, but you are not “required” to wear a wig if you have alopecia. Do whatever makes you feel the most comfortable, and the most confident. Do not worry about what other people say. What do I say if someone asks me about my bald spots or my wig? Honesty is the best policy. It may be hard, but it’s better to tell someone the truth than to make up excuses about your hair. However, if you feel uncomfortable talking about your hair, then tell that person just that. They should respect what you have to say, and quickly change the subject. You should be prepared that some people may turn you down because of your hair loss. Unfortunately, not all people are sensitive to cosmetic problems or medical conditions. However, be re-assured that there are also a lot of people who think what’s on the inside is more important than what’s on the outside, and besides, you can still look beautiful and confident with alopecia, whether or not you wear a wig, are bald, or are patchy. Remember, your friends and your crush should care about you for who you are, not how your hair looks. 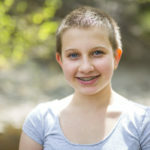 Many girls find it easier to be honest with their date and tell them about alopecia areata and let them ask questions. Other young women prefer not to share the fact that they have alopecia at all or they decide to wait until they know the person better. How do I tell my friend/BF/GF I have alopecia? Tell them in a comfortable setting where you feel safe. You don’t have to show them your hair if you are not ready to do so. Keep in mind this is new for them too, so give them a few minutes to take it in. However, they are your friends and/or significant other(s) for a reason; they care about you. You can buy a wig in many retail stores such as at a mall or free-standing shops. It’s literally just a Google search away. You can also purchase wigs online. However, it’s best to try a wig on in a store first, to see what color, length and fit you like before ordering wigs online. Can I go swimming with alopecia? Totally! If you want to wear a wig, you can look into “vacuum wigs” which seal to your head and will stay on under water. However, in order to wear one, you will need to shave your head. If you don’t want to wear a wig, you can wear a scarf, hat, swim cap or, you can go bald! There should be no shame with any option. What different types of wigs are there? There are many different types of wigs on the market, which may seem overwhelming at first. Full Lace – these are wigs that look like they have a “scalp” all around the entire wig. They are beautiful but they can cost hundreds of dollars. You can hold them in place with wig glue, wig tape, or bobby pins. Lace front wigs – they only have the lace in the front of the unit. The rest has a thicker cap. These are just as beautiful as full lace, but tend to be a lot less expensive. Monofilament – this is a type of wig with a mixture of lace and nylon, that when placed on your head, it looks like the hair is coming out of your own hair follicles. How can I fill in my eyebrows/eyelashes? There are eyebrow/eyelash pencils, microblading, eyelash extensions, false eyelashes, and yes, even fake eyebrows. You could also get a wig with long bangs that cover your eyebrow area. It may take a while to get your confidence back, but with time, you will. Don’t expect to feel like your old-self overnight. Eventually, you will feel comfortable with your new routine, and your situation won’t feel as shocking. Make sure you hang out with friends with whom you feel comfortable with, be active and do activities you love, and don’t stop doing things that you enjoy just because you’re afraid. What does it mean if my hair grows back white? This is extremely common. Hair will initially grow back white or very light blonde, like peach fuzz, but it will turn back to your original color (before your hair loss). Having alopecia areata can be tough to deal with at first, just keep in mind that treatment can be effective and cosmetic therapies can make you feel more confident. You are healthy and can still participate in the activities you enjoy.